You will have seen the news that the Parish council is funding two new waste bins in Bomere Heath, in order to provide a more even spread of facilities across the village for residents and in particular dog walkers. This is all part picking up the issues of concern, which residents identified in last years Community Led Plan questionnaire. To reinforce the general concern with a minority of dog owners, which allow their dogs to foul public places, we have also launched a poster campaign in the village. The posters use a similar design to those used in a nationwide ‘Keep Britain Tidy’ campaign using a pair of ‘watching eyes’. By drawing attention that offending dog owners may be reported, proved to be an effective means of reducing dog fouling reports. 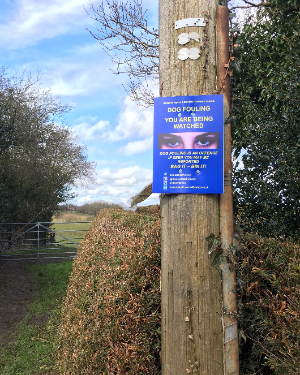 Posters carry contact details for members of the public to report dog fouling problems to Shropshire Council who have the responsibility for enforcing persistent offenders. Reports can also be passed by telephone to Shropshire Council on 0345 678 9006. Please provide as much information as possible, such as at what time the incidents are occurring, a description of the dog walker and dog, and where the fouling has occurred. Shropshire Council patrols can then be targeted more efficiently.